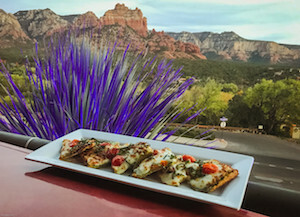 Sedona is known as a geological wonderland, with spectacular views, unlimited outdoor activities, and foodie destinations galore. The difficulty is deciding how to make the most of your visit, but a passion for hiking and a well-earned post-trail happy hour can make for the perfect getaway. Here are two don’t-miss trails, along with happy hours offering outstanding value, tapas, and libations. HiLine Trail is a moderate 5.4-mile hike without the crowds and with incredible views of iconic Bell Rock, Courthouse Butte, and Cathedral Rock. After a short hike to the ridgeline the trail flattens out, providing endless views of red rock formations and the Munds Wilderness area. Hike 2.7 miles to a bluff opposite Cathedral Rock and return on the same trail. Park at Yavapai Vista Trailhead. Hangover Trail offers magnificent views of Oak Creek Canyon, unlimited photo opportunities, and solitude; it’s a difficult 8.8-mile hike for the experienced who aren’t afraid of heights. Head out on Munds Wagon Trail to connect to Hangover Trail and hike clockwise, following the white paint markers and watching for bikers. Park at Munds Wagon Trailhead off Schnebly Hill Road and arrive before 8:30 a.m., due to limited parking. 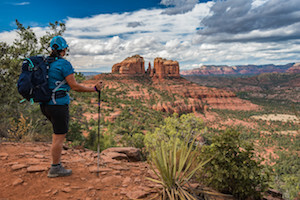 Bonus Tip: Visit The Hike House for trail details, hiking gear, and to purchase their invaluable “Sedona Hiking Guide Book” before hitting the trail. 431 State Route 179, 928-282-5820, www.thehikehouse.com.